Screenshot via MSNBCAaron Stark on MSNBC. A Colorado man wrote an open letter in which he said he “was almost a school shooter” but didn’t carry out such an attack because he lacked access to guns. He told MSNBC that he believes love and connectedness, like a random act of kindness from a friend, could help prevent mass shootings. “I had a severe lack of love, and I really think this kid did too,” he wrote, referring to the 19-year-old charged in last week’s shooting at a high school in Florida. In the letter, Aaron Stark says that as a high schooler in Denver in 1996, he was bullied and began stockpiling small weapons. But he lacked easy access to high-powered guns like the assault rifle used in last week’s shooting at a high school in Florida that left 17 people dead. Stark’s letter describes a rough childhood in which he was abused and neglected at home and faced relentless bullying at school for his weight, intelligence, and often unwashed clothes. Depressed and homicidal, Stark felt he had nothing to live for, he said. “When someone has nothing to lose, they can do anything, and that thought should be terrifying,” he wrote. Stark told MSNBC that while “we really need to have a hard look at the effect that guns have,” he believes that ultimately love and connectedness can help prevent mass shootings. Stark drew parallels between his life and that of Nikolas Cruz, the 19-year-old charged in the Florida school shooting. Cruz is said to have had a troubled upbringing and felt disconnected from his home life. After his adoptive mother died last year, Cruz stayed with a family, who told CNN this week that he described himself as depressed. 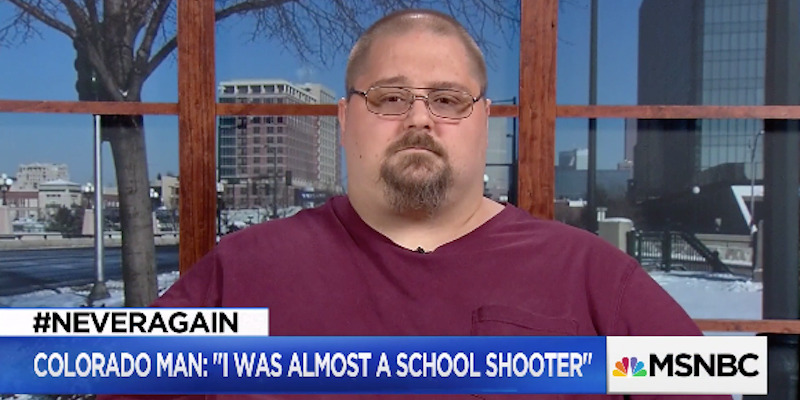 When asked during the MSNBC interview whether love alone had been enough to stop him from acting on his homicidal and suicidal feelings, Stark shared a heartfelt personal story. He said that made the difference.